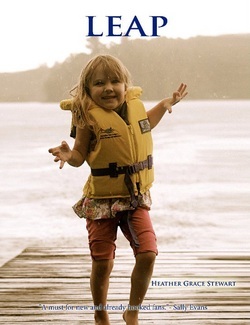 Heather Grace Stewart wrote her first poem at age five, inspired by falling down a lot while trying to figure skate. ‘At the Arena’ was published in her school newsletter. From that moment on, Heather was hooked on writing. Her two non-fiction books for youth are part of the Warts & All educational series on Canada’s Prime Ministers. She has written for a wide range of magazines, including Reader’s Digest and Canadian Wildlife magazine, and edited a Canadian law magazine for students for four years. Heather is a full member of the League of Canadian Poets. Her poems have been published in Canadian literary journals, newspapers and magazines, nation-wide school textbooks, online journals, international print anthologies, and in the British small presses. She was awarded Queen’s University’s McIlquham Foundation Prize in English Poetry and the UK journal Various Artists’ Poet’s Poet Award. Born in Ottawa, Canada, Heather lives with her husband and daughter near Montreal. In her free time, she loves to take photos, scrapbook, cartoon, inline skate, dance like nobody’s watching, and eat Swedish Berries — usually (but not always) not at the same time. "Destined to become a family heirloom." "Echoes of Seuss." "Priceless." These are funny, touching poems for the young and the young at heart by Canadian poet Heather Grace Stewart and illustrated by 5-year-old Kayla Mae Stewart. Perfect little poems for those "how'd it get so late?" nights when the kids say, 'just one more short story, pulleeeease?" A whimsical, engaging read for preschoolers, beginner readers, middle graders —and the child in all of us. Half the proceeds go to Unicef's Gift of Education project. "A lovely lilt of language slides between the horrendous and hilarious in these poems." -Penn Kemp, author of 25 collections, celebrated foremother of Canadian sound poetry. “Readers of Where the Butterflies Go will already be expecting accomplished, fresh and lively work from Heather Grace Stewart, but even they will be surprised by the strength of this new collection, this genuine Leap, so direct, political and feminine by turns that it can take your breath away. A must for new and already hooked fans.” —Sally Evans, poet and Editor, Poetry Scotland. "Whirlwind poetry that never hesitates...always delightful and rarely what you expect. We need poetry like this." —Sally Evans, poet and Editor, Poetry Scotland. "Thanks to an exhilarating directness and a worked-for simplicity of language, not to mention a nicely self-deprecating sense of humour on occasion, this is a book full of sharply drawn images, honest poignancy and frank admissions. "—Poet-Journalist Tom Phillips. "These poems have a humanity, a goodness, an almost other-worldliness about them." —Tony Lewis-Jones, Author of Anytime and nine other collections. Half the proceeds go to Unicef's Gift of Education project.